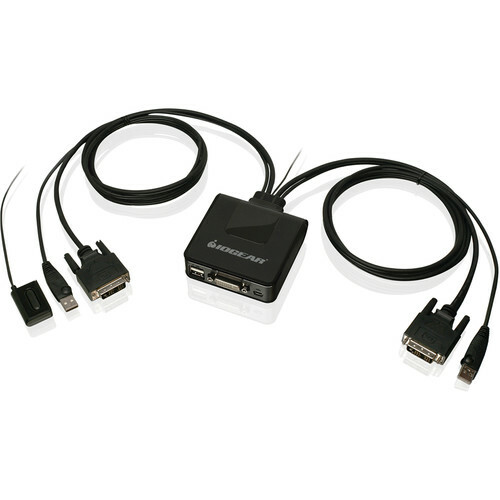 The 2-Port USB DVI Cable KVM Switch from Iogear allows you to share two computers using one DVI monitor, one keyboard and one mouse. It supports video resolutions up to 1920 x 1200 at 60 Hz giving users crisp images on the screen every time. The switch supports USB hot-plugging, making it easy to add or remove USB computers connected to the KVM. You can access any of the connected computers via a push button. This switch is a plug and play solution, with no external power supply required. It is suitable for home, office, or small/medium size businesses to streamline or develop efficient workstations, by eliminating multiple desktop setups. Box Dimensions (LxWxH) 8.661 x 6.063 x 2.362"
2-Port USB DVI Cable KVM Switch is rated 4.3 out of 5 by 8. Rated 3 out of 5 by Grovester from Works Works well although does sometimes seem to interfere with the signal to the monitor (flickers) and the various leads could be a little longer. Rated 5 out of 5 by Angell from A bit slow switching, but works well My work (Windows) laptop is typically docked and connected to two 22" monitors, one VGA connection and one DVI connection. I have a Mac Mini as well, using the DVI input on second monitor (with HDMI to DVI converter). Was previously using wireless mouse and USB mechanical keyboard for the laptop, and a wireless keyboard/mouse for the Mac, switching inputs via the monitor menu. Too much clutter. Finally bought the KVM switch; should have done it years ago. Now I have just the wireless mouse, USB mechanical keyboard, and an easy push-button swap between Mac and work laptop. My only minor complaint is the 3-second lag when switching. First world problems. Graphics are fine for me, but I'm not pushing anything graphics-intensive on either machine. Overall, a wonderful addition to the home office to reduce clutter and make toggling between work and wasting time during work hours much easier. Rated 5 out of 5 by Tomascco from Remote! Ask for a simple DVI/USB KVM switch and get one with this cool little wired remote! No more fumbling for the big switch or trying to remember key commands. That little remote with adhesive is stuck to the monitor base. One click and I'm on the next machine. Simple setup. Integrated cables make it nice. And fast switching, with the little remote, of course, makes it sweet! Rated 5 out of 5 by spifee clifee from Veiwing 2 computers on one screen I was looking for a way to view my mac pro desktop 2008 model and my mini mac on the same screen this usb dvi cable kvm switch by IOGEAR is the perfect connection,i am very happy with this product it makes everything so simple.I would definitely recommend this product to anyone trying to connect 2 computers and view them on the same screen. Rated 5 out of 5 by Nona from Good Product One monitor, two computers. Both computers have DVI port. This product is working well - 1 week. Had similar product from IOgear - for VGA. Used for 10 years - no problems. Rated 5 out of 5 by B.P. from Nice little KVM Switch It was easy to set up and install. It's very straight forward. It switches between 2 computers as it's meant too. I would recommend if this is your intended goal. Rated 5 out of 5 by Peter from Perfect Solution for small desk, and two computers Great price! Simple install, plug your mouse and keyboard into the unit and plug the wires out of the unit into each CPU and a single monitor. The KVM allows you to use the same mouse, keyboard, and monitor on two different machines.